The most amusing fashion combo that springs to my mind involves pairing that nice pencil case with a matching set of tasselled pasties*. *I am not referring to baked goods. Okay, this one is complicated, but! So, you already have a pencil case that matches your underwear. 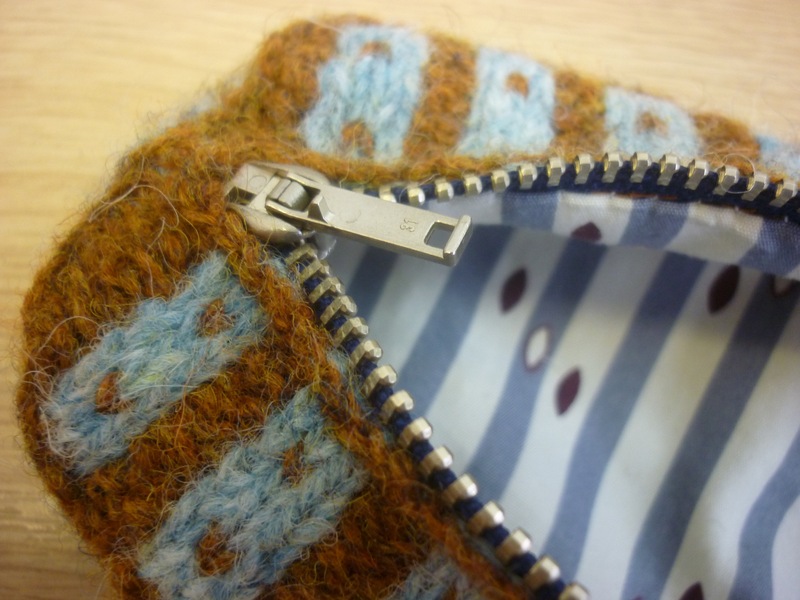 I think that the next item to make would then be an egg warmer (a mini-bobble hat in a Sanquhar pattern?). A matching set of underwear, pencil case, and egg warmer like that will mean you can have breakfast in bed (while penciling down the egg warmer pattern), and thus be cozy and ultra-stylish at the same time! Happy Easter! My server was acting funny- I seem to have posted twice – so sorry. Please delete one if you’d like. What a delicate piece of work u made!!! Is it a deeper meaning w the boxerpant material? ” I want to keep you as close to my body as my undewear are”…..? Congratulations on the publication of your first pattern, and a very fine design it is too, with interesting construction techniques that would certainly test my knitting skills! 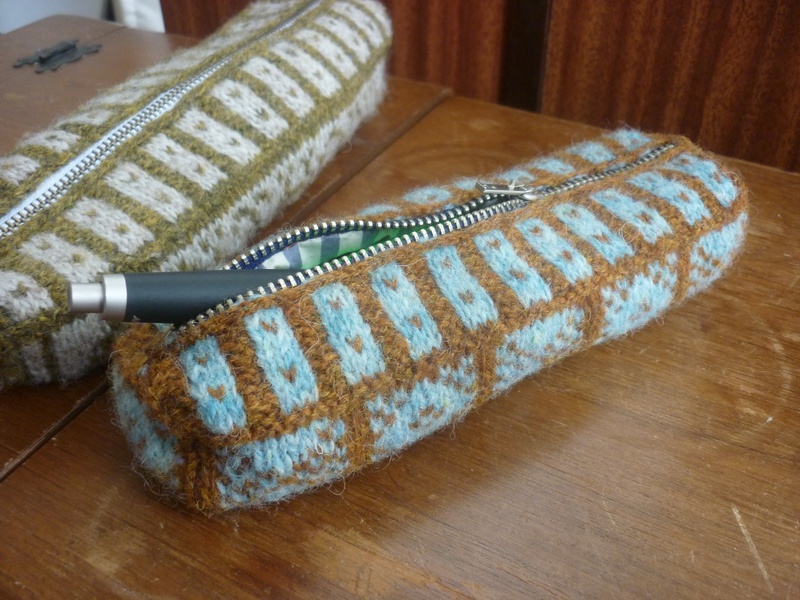 If were I to succeed in making this pencil case, I would co-ordinate it with some sort of security device – maybe a chain from the zip-pull to my wrist? a loud alarm? – to ensure I didn’t lose it (or have it pilfered by an envious person lacking stylish pencil storage?). I’m not sure how ‘this season’ my co-ordinating security device would be, but it would be practical! Oh … I’ve just re-read above and wonder if the idea was to suggest things to co-ordinate with the lining? Never mind, I can’t possibly top your knicker-matching, so I’ll stick with my original idea! Knitted Sanquhar bra. (But- would need a nice soft lining to stop the itching!) Got to top the knickers, or maybe even have both – only you and your partner would ever know, unless you sunbathed in them. Or how about a swimsuit to show off the fabulous pattern? The modern pencil case surely needs a coordinating iPad cover, lined with the appropriate (non-static) boxer shorts cotton! It’s a lovely pattern and I will certainly be making one, but with a less imaginative lining I fear. I think the obvious complement would be a knitted slip-on cover to put around my latest sketch book, in which the pencils would come into great use. Not an amusing answer, but tremendously practical. 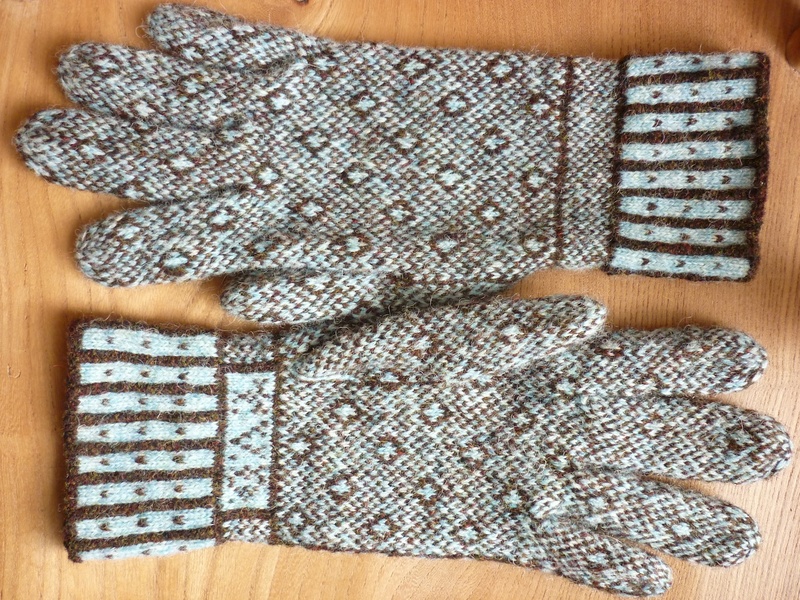 Been eyeing the Sanquar gloves pattern for years now, but am I ever going to knit them? The pencil case seems do-able. Amusing, no. Realistic, perhaps. And we all need some burnt umber and surf in our lives, don’t we? what would I coordinate a Sanquhar pencil case with? Well some of my best vintage pencils and fountain pens of course, putting such lovely vintage objects in a vinyl or fake fur pencil case is just wrong whereas this pencil case is so right. At a more detailed level, I’d coordinate it with a black vintage Italian Aurora 88 piston filler fountain pen from the mid 1950’s, filled with J Herbin Vert Olive ink, A Parker 45 GT thatI bought new in the 1980’s now fitted with a Binderised CI nib filled with Diamine Damson ink, a Parker 51 classic pen in grey, circa 1953, filled with Pelican Mandarin ink – and matching P51 clutch pencil that takes 0.9mm leads, and a swiss made Fix pencil commemorative issue with ‘designed in 1929’ on the side. I’d also hide my coffee card in there so i could top up with a chai latte as I caught up on my letter writing. I love the pattern and your color choices. Looks like a fun knit. I would like to see an iPad cover to go with.